As promised last week, I'm trying to review a book a month, my favorite read in a 30 day period. April is such a hectic month, what with the A-Z challenge and all that, but I wasn't going to use that as an excuse. 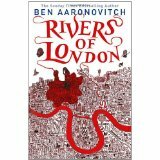 I bring you Rivers of London by Ben Aaronovitch. Or if you buy it in the States, Midnight Riot. Poor Peter Grant. He became a London police officer to chase down thieves and slap on some cuffs. But when he finishes training his commanding officer tells him he'll be assigned to a glorified paper pushing division. That is, until he meets a murder witness that happens to be a ghost. Grant than finds himself to be the wizard apprentice of Thomas Nightingale learning magic, Latin, and discovering there are worse things than vampires and werewolves. For one, Mother Thames and Father Thames are having a territory dispute. Not all rivers get along, and Grant has been given the task to make things work between the two deities. But fighting rivers is that big of a concern compared to a string of murders involving people's faces falling off. Something in London is sucking the magic out of places, things, and people in violent ways that Grant and Nightingale have to get to the bottom of. I've never really read mystery books, I find the genre more entertaining on TV than on paper, but I really enjoyed this book. I didn't expect how a lot of the plots were wrapped up, and there were a bunch of layers of relationships between the characters and the places in London. After all, river gods get their power from the rivers themselves. The best part is simply Peter Grant. He has a roll your eyes attitude at things and a flat sort of humor. Okay, this is a British book so maybe it's just British humor, but the sort of non-nonchalance he gives to killing vampires and the bureaucratic of the London police makes him solid. He knows parts of what he's doing is crazy and makes no sense , like sniffing dead bodies for traces of magic, and quite regularly makes sarcastic comments about his job like how the London police greeting is 'Oi! What do you think you're doing?'. Grant's also a secret geek, calling Nightingale Harry Potter and joking about magic coming form midiclorians. There's a lot more to the world than Aaronovitch tells us. Nightingale and the river deities make allusions to 'an agreement' Grant has no idea about and as Grant does research on subjects pertaining to the case you learn about the scholarly world of magic and watch Grant come up with his own theories, which may or may not be right. But what you do read about is amazing. To much magic is bad for you, just like drugs, and Grant makes connections between spell casting and music. It also, sadly, does not work well with technology. Cast a werelight with your phone in your pocket and you have to buy a new one. There are also layers of magic, based on time and location, and buildings soak it up. There are ghost police and ghost eaters, sirens and river nymphs, sharp toothed maids and creatures with teeth were the sun don't shine. Despite how fantastical the case is, the way it's solved is pure non-fiction. There are disputes between police departments, lots of searching through paperwork, and wrong guesses. This is not one of those quick cases, it takes Grant and Co roughly six months to figure out who is causing people's faces to fall off and stop them. I'll be honest, this isn't a quick read. It's a decent sized book and while the story moves it didn't grab me to the point where I'd sit and read for hours. But it was constantly in my head and thoughts of Grant's case were never far from my mind. It's a great read to use when you have a lot of actual work to do, because it serves as little vacation from grading papers and lesson planning without sucking you in too deep to not break off and get back to you job to finish by the end of the day.